Special note regarding the eBook version: Some figures have been redacted in compliance with digital rights permissions. 1. Framework for Thinking Through Quality Questioning: In What Ways Can Quality Questioning Advance Both Student and Teacher Thinking? 2. Frame Quality Questions: What Are the Characteristics of Questions That Engage Students in Thinking and Deep Learning About Content? 3. Strengthen Thinking-to-Learn Behaviors: How Can Teachers and Students Use Quality Questioning to Deepen Thinking and Increase Learning? 4. Use Formative Feedback: How Can Questioning Serve as Formative Assessment and Feedback to Advance Student Learning? 5. Developing Response-Ability: In What Ways Can Teachers Cultivate and Nourish Student Responsibility for Learning? 6. Create a Culture for Thinking: How Can You Use Quality Questioning to Create a Classroom Cultue Where Students and Teacher Work Together to Advance Thinking and Knowing? "This book delivers on the double meaning of its title. It makes a compelling argument that quality questioning is the primary catalyst for thinking in the classroom and offers practical tools for crafting questions worth thinking about. I have found no better resource for unleashing the power of questioning as a force for student learning in the 21st century than Thinking Through Quality Questioning." "Any educator who believes that our students MUST be able to think deeply in order to flourish in our world today and in the future, will not be able to put this book down!" "The skillful use of questioning in a classroom is vital to student engagement and learning. It's difficult to imagine a classroom in which students are involved in deep conceptual learning that did not depend for its success on the teacher's use of questions to promote thinking and engagement. The authors fully explore this important topic." "Be prepared to question how you teach. Thinking through Quality Questioning provides an easy to follow format of how teachers can authentically engage students and instill in them a desire to question and search for answers. A must-read for teachers!" “Thinking Through Quality Questioning not only provides the tools needed to frame effective questions, it also provides the structures necessary to elicit thoughtful student responses and dialogue. 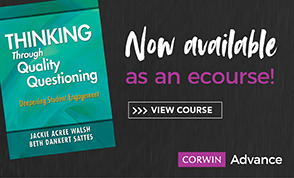 The book guides educators through the process of creating a classroom rich in productive interactions by providing both practical examples and supporting frameworks." "For educators who value student engagement, inquiry, and self-efficacy, this is the book. Based on 22 years of study, Jackie Walsh and Beth Sattes provide a framework for posing quality questions that promote student metacognition and responsibility, as well as provide feedback to inform instruction. As partners in learning, teachers and students will both benefit as a result of the researched knowledge and practical strategies offered in Thinking through Quality Questioning." “The critical challenge for educators today is to successfully prepare students for a world which we don’t yet know, and for jobs that don’t yet exist. Schools must transform students into independent, lifelong learners equipped to make thoughtful decisions. Thinking through Quality Questioning is a valuable resource for teachers committed to helping students learn how to learn." · Presents short vignettes of quality questioning in action in both elementary and secondary classrooms in a range of content areas. · A perfect sequel to their bestselling Quality Questioning.